Trance arrived to the Congo way before 1990, strobe lights and super clubs. Traditional bazombo trance. Konono No. 1 play this trance, a hypnotic continuum of polyrhythms and melody lines, through instruments sourced from the street. Authentic drums are supplemented by salvaged steel containers, pots and pans; likembé (thumb pianos constructed from metal rods attached to a resonator) of varying registers are amplified with magnets sourced from old car parts to rise above the Kinshasa din. The band was founded some forty years ago by Mingiedi, a virtuoso of the likembé, who, upon arriving in the Congolese capital from the Bazombo area on the Angolan border, wished to bring something of his tribal ancestry to the urban sprawl. That's how the story goes, in any case. So outta the block parties of Kinshasa, Konono's sound evolved, eventually crossing cultures to make accidental connections with Western electronic dance music. The band's practice was first picked up by European ears by Vincent Kenis of Crammed Discs, who produced their 2005 self-titled debut as the first release of the Congotronics series, to unexpected critical acclaim. 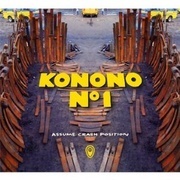 Assume Crash Position wiles out the sound of Konono's first, their long-spanning rhythms honed into eight tracks of hip-shaking whistle-making fanfare, relentless riffs and the kind of African rhythms now once again appropriated by contemporary avant-rock music. The music dips and dives like bodies through a crowd, clearing to lulls in which field recordings of children's chatter and community carnival populate what-would-be quiet, before giving way to another round of clattering drums and folk verse. In a sense this isn't the sort of music that fits an album track format - sixty minute cycles split into somewhat arbitrary segments seem an artificial imposition on what is meant to be heard out-of-doors, shared in person and left to continue into the small hours of a humid night. But that you can listen to the colours of the Congo in compact on your stereo may only be a good thing. This trance has dancing heels, heels that dig deeper than the drum machine footsteps of European soils.